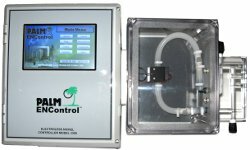 Palm Technology manufactures a line of automatic bath controllers "ENControl" that can be used to monitor and maintain an electroless nickel plating bath. The ENControl system receives a measurement of the bath's condition from the sensor, and decides what corrective action is needed. Next, if the bath parameters are within their accepted limits, it will start the pumps to make an addition proportional to the difference between the optimum and the sensor's measurement. Then, after a delay to allow the bath to be completely mixed, it will repeat the measurement to check that the solution's concentration and pH have returned to their normal level. If the bath parameters are outside of their accepted range, the controller will sound an alarm, but take no other action. The ENControl system will also record all of the readings it has received and any action it has taken. In addition, the system tracks chemical usage, bath age, and the remaining supplies of replenisher. The operator can communicate with the system to access recorded information, to revise sampling periods and control ranges, and to calibrate the sensors. The ENControl system can also print a hard copy of the data it has collected or oftentimes transmit it to a personal computer for further analysis. The primary advantage of an ENControl automatic controller is their effect on the bath's plating rate and production. The plating rate of electroless nickel solutions is dependent upon the bath's concentration, pH and temperature. As they fall, so does the amount of deposition. Thus, the bath's rate is not consistent, but declines as the solution is used and increases when it is replenished. The more a solution is allowed to decline, before an addition is made, the lower will be its average plating rate. With manual additions, seeing baths plated down by 15 or 20 percent is common before they are replenished, especially under conditions of high bath loading. With closed loop control, however, this cannot occur. The concentration and pH of the solution will be maintained within 2 to 5 percent of optimum. With some baths, this can increase the plating rate by 20 percent. By maintaining the bath in its optimum range, an ENControl system helps extend the life of the electroless nickel solution. Controllers also help maintain the quality of the deposit and reduce rejected parts. They can also provide more complete bath records and allow the plater to better manage his operation. Palm Technology's top of the line Electroless Nickel controller. This unit measures both Nickel and pH and features a user friendly 7 inch touch screen.